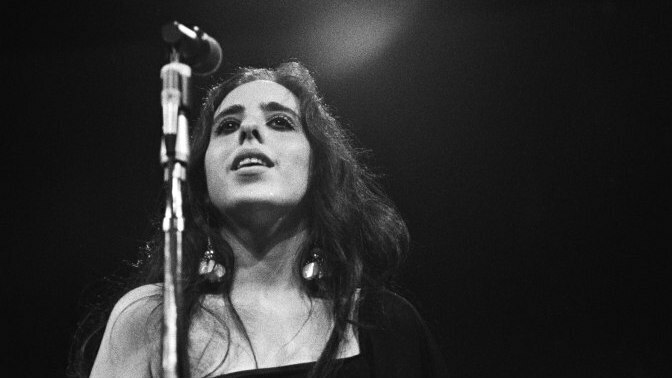 Laura Nyro's Lasting, Eclectic Musical Legacy Most of the names announced for induction to the Rock And Roll Hall of Fame this week are familiar. The name Laura Nyro, however, may need some explaining. Her songs outlasted their times, and today, a range of artists call her an inspiration. Laura Nyro performs at the Monterey Pop Festival in 1967. Most of the names announced for induction to the Rock And Roll Hall of Fame this week are familiar: Guns N' Roses, Beastie Boys and Red Hot Chili Peppers. The name Laura Nyro may need some explaining. She was the daughter of a New York jazz trumpeter, who took her along to his gigs. She sold her first song, And When I Die, to Peter, Paul and Mary for $5,000 when she was just a teenager; left New York's School of Music and Art; and became a star at the 1967 Monterey Pop Festival at the age of 20. Laura Nyro played and sang her own songs, and wrote a lot of hits for The 5th Dimension, Barbra Streisand, and Blood, Sweat and Tears, including Stoned Soul Picnic, Sweet Blindness, Time and Love. Today, musical performers from Kanye West to Yo Yo Ma are called "eclectic." Laura Nyro was eclectic before people used the word to talk about pineapple salsa. She wrote cunning, poetic verses, music that popped with a doo-wop, and sang with gospel verve. Her songs swelled with the brass and sheen of Manhattan, and the funk and jive of Brooklyn and Queens. But Laura Nyro was scalded and appalled by the intensity and nonsense of being a celebrity. She stopped performing at the age of 24, before she could burn out. Over the next 25 years, she made occasional appearances at benefits. But Laura Nyro was just 49 when she died of cancer in 1997, her music admired but piled on a musty shelf with peace symbols and bell-bottom jeans. Yet her songs also outlasted their times, and today, artists as eclectic — that word again — as Elvis Costello; Ricki Lee Jones; Audra McDonald, the opera soprano; and Jenny Lewis, the indie rocker, call Laura Nyro an inspiration. Let's remind ourselves why. In the long, hot summer of 1968, wars overseas were blowing up at home. Protests rang in the streets. Fires and fury raged. And Laura Nyro went into a studio and sang out the passions of the times. Who does that today?